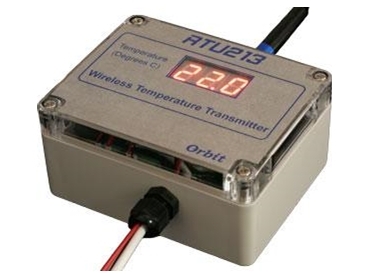 Orbit Communications has released RTU200 wireless temperature monitor system. The system comprises a master unit (RTU214) that displays current temperature at each remote location and up to 254 remote temperature transmitters (RTU213). The remote temperature transmitter units have a single temperature probe input and a 3-digit, 7-segment display to show the read temperature at the remote location. The temperature is displayed with 0.1 Degree Celsius resolution. The Master unit has a 10Amp normally open relay contact that is activated during alarm conditions. Both over-temperature and under-temperature set-points are user programmable and each set-point alarm can be individually enabled or disabled.